Sea Rocks is an easy choice for a family getaway or couples’ vacation. The lap pool is great for morning swims, and the upper and lower living rooms gives everyone plenty of space to spread out. All five suites are totally equal, too, so you can travel comfortably. 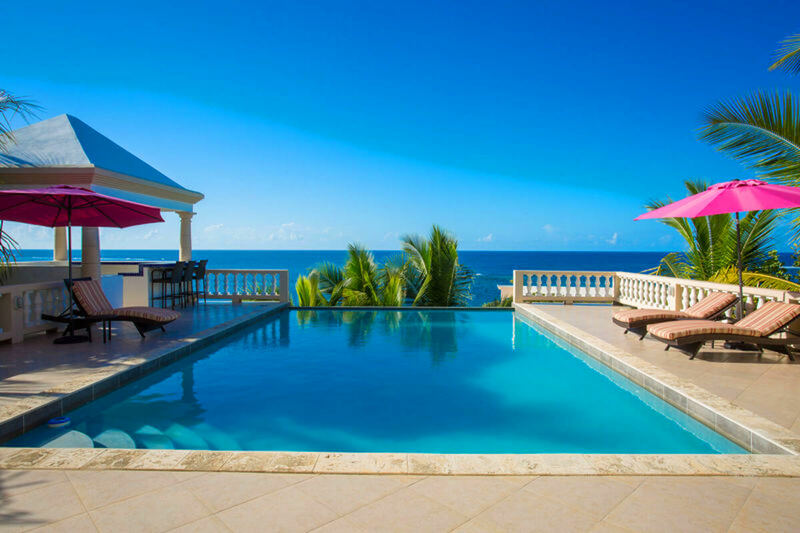 Sea Rocks is a two-story villa with classical architecture and a large lap pool. Six bedrooms, two living areas, and a wraparound deck leave plenty of room for couples or families. The lap pool stretches across the oversized deck and points to the sea. Loungers, a bar area, and a grill surround the pool, and there are several places to sunbathe or relax in the shade. A pathway shared by two neighboring villas leads to a rocky cove with sea access. Sliding glass doors lead into the living room, which is furnished with cushioned sofas, a flatscreen TV, and a sitting area. A dining table sits between the living room and kitchen, and the kitchen is outfitted with standard appliances, a gas grill, and a deep dual-basin sink. There’s more dining space at the breakfast bar, as well. Upstairs, there is a second living room with a kitchenette. Sea Rocks has six king suites with ensuite bathrooms and private balconies. Air-conditioning and WiFi run throughout. Sea Rocks is on the northern coast near Shoal Bay Village. The northeastern peninsula has several beaches and bays to explore, so Sea Rocks is perfectly positioned for adventurers. Rates do not include: tax of 12%, damage waiver fee of $70.00, island charges of $375.